Human PD-1, Fc Tag (PD1-H5257) is expressed from human 293 cells (HEK293). It contains AA Leu 25 - Gln 167 (Accession # NP_005009.2). The protein has a calculated MW of 42.6 kDa. The protein migrates as 56-66 kDa under reducing (R) condition (SDS-PAGE) due to glycosylation. Human PD-1, Fc Tag on SDS-PAGE under reducing (R) condition. The gel was stained overnight with Coomassie Blue. The purity of the protein is greater than 95%. 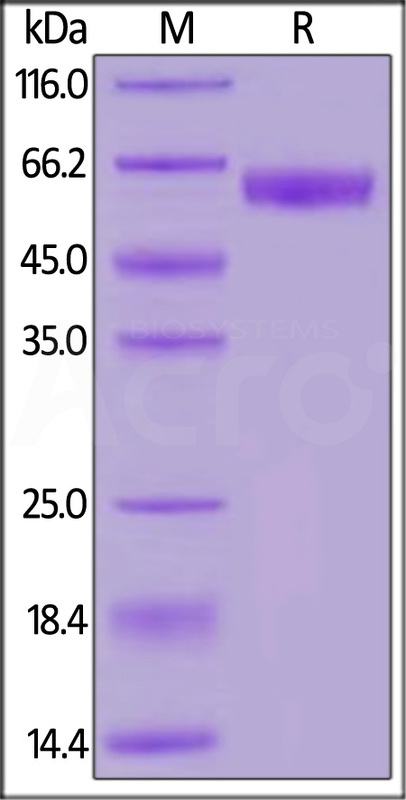 The purity of Human PD-1, Fc Tag (HPLC-verified)(Cat. No. PD1-H5257) was greater than 90% as determined by SEC-HPLC. 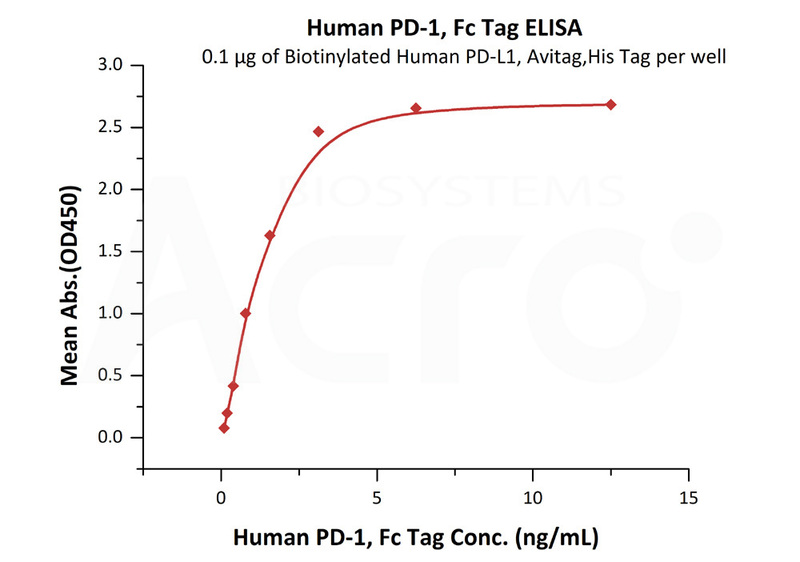 Immobilized Biotinylated Human PD-L1 (recommended for biopanning), His Tag, Avi Tag (Cat. No. PD1-H82E5) at 1 μg/mL (100 μL/well) on streptavidin precoated (0.2μg/well) plate, can bind Human PD-1, Fc Tag (Cat. No. PD1-H5257) with a linear range of 0.1-3 ng/mL (QC tested). Immobilized Human PD-1, Fc Tag (Cat. No. 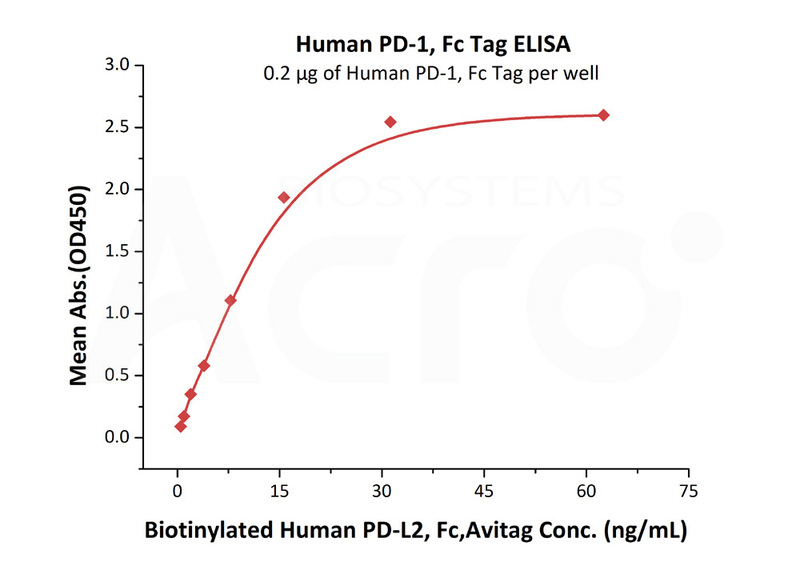 PD1-H5257) at 2 μg/mL (100 μL/well) can bind Biotinylated Human PD-L2, Fc Tag, Avi Tag (Cat. No. PD2-H82F6) with a linear range of 0.5-16 ng/mL. (Routinely tested). 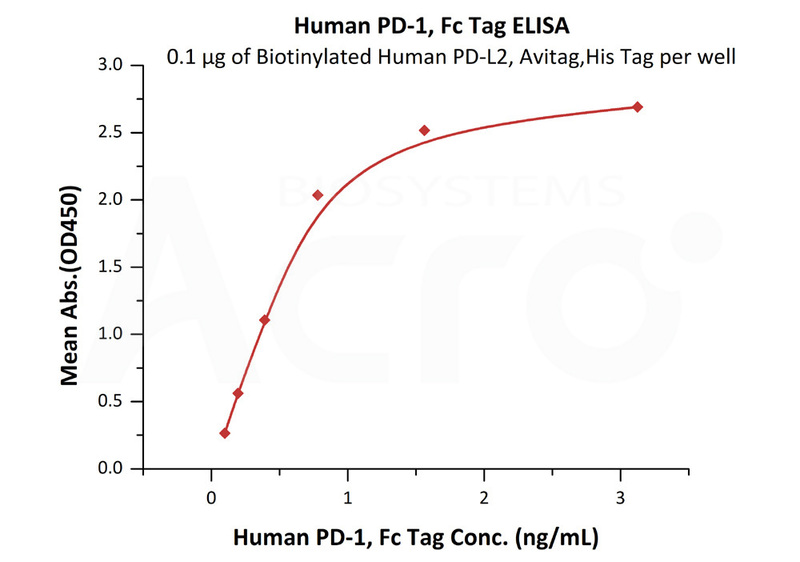 Immobilized Biotinylated Human PD-L2, His Tag (Cat. No. PD2-H82E8) at 1 μg/mL (100 μL/well) on streptavidin precoated (0.2μg/well) plate, can bind Human PD-1, Fc Tag (Cat. No. PD1-H5257) with a linear range of 0.1-1 ng/mL (Routinely tested). Human PD-1, Fc Tag (Cat. No. 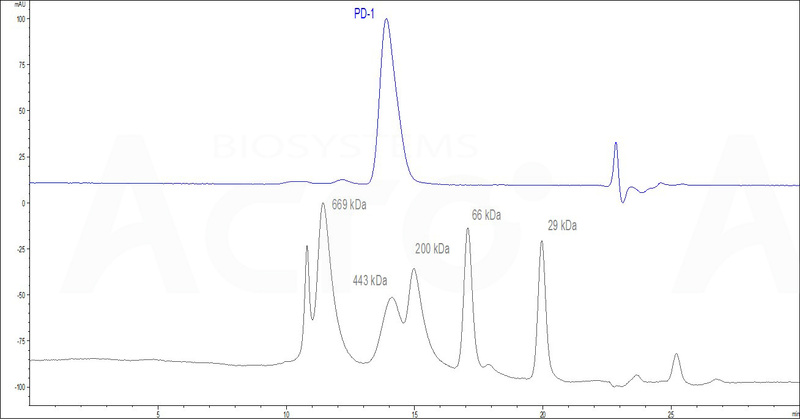 PD1-H5257) captured on CM5 chip via anti-human IgG Fc antibody, can bind Human PD-L1, His Tag (HPLC-verified) (Cat. No. PD1-H5229) with an affinity constant of 3.6 μM as determined in a SPR assay (Biacore T200) (Routinely tested). 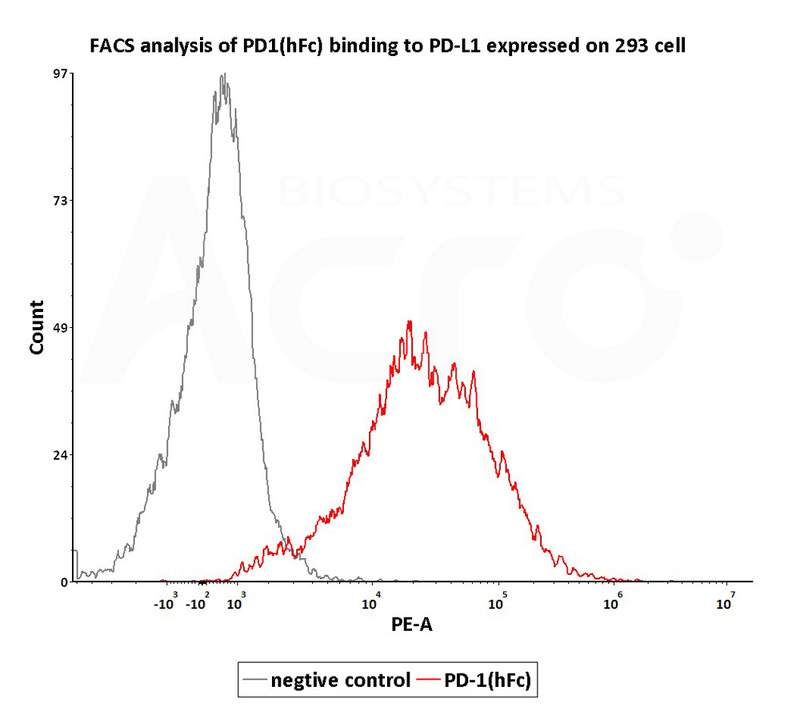 Flow Cytometry assay shows that recombinant Human PD-1, Fc Tag (Cat. No. PD1-H5257) can bind to 293 cell overexpressing human PD-L1. The concentration of PD-1 used is 1 μg/mL (Routinely tested). Authors: P Liu, et al. Authors: Zhenwu Li, et al. A novel PD-L1-targeting antagonistic DNA aptamer with antitumor effects.